Guess what? I added another loom. You might think I already have plenty of looms. This one is a beautiful, well-cared-for 120 cm Glimåkra Standard countermarch loom. It’s the first real step toward another big dream—drawloom weaving. What a pleasant surprise for me to find out that the dear person handing off this loom is one of my blog friends from right here at Warped for Good! And not far from our Texas hill country home. Thank you, friend! Glimakra Standard, 120 cm. 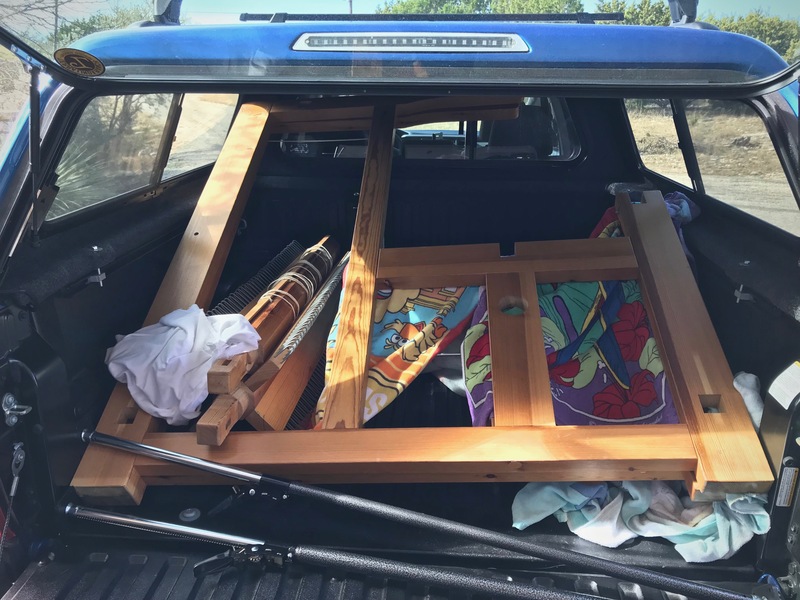 The side gables fit, but just barely, in the covered bed of our Tacoma pickup truck. Sticks. A Swedish loom is mostly a pile of sticks all fitted together just so. There are a few things to be done before drawloom weaving becomes a reality for me. Read, re-read, and review everything I can get my hands on about drawlooms and drawloom weaving, especially Joanne Hall’s new book, Drawloom Weaving, and Becky Ashenden’s DVD, Dress Your Swedish Drawloom. Fix up the light-filled room in the hangar (did I tell you we have an airplane hangar on our property?) where there is ample room for the extended-length drawloom. Order the drawloom attachment and supplies. Move the loom to its special room in the hangar. 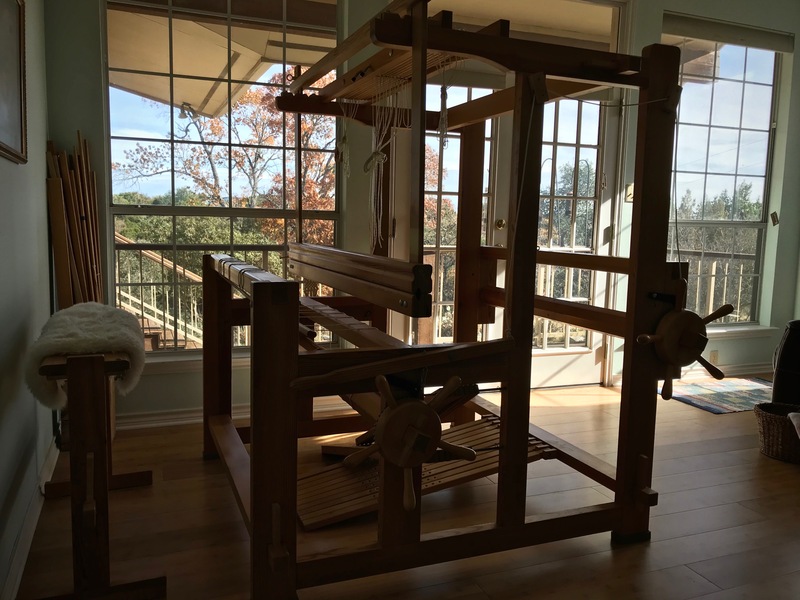 Loom with a view of Texas hill country. Perfect temporary spot. May you take a step closer to your biggest dreams. What a lovely blog friend! Most likely, she couldn’t think of anyone more deserving. The temporary spot is, well, perfect! What a beautiful, light-filled spot for her! I’m sure she’ll be happy there. Hi Betsy, I’ll see to it! It’s going to be a pleasure to get acquainted with her. What a wonderful gift. The temporary space is fantastic. Love all the light and of course, our beautiful Texas views. Congratulations. Hi Michele, I can’t think of a better place to sit at a loom! It’s going to be a joy. 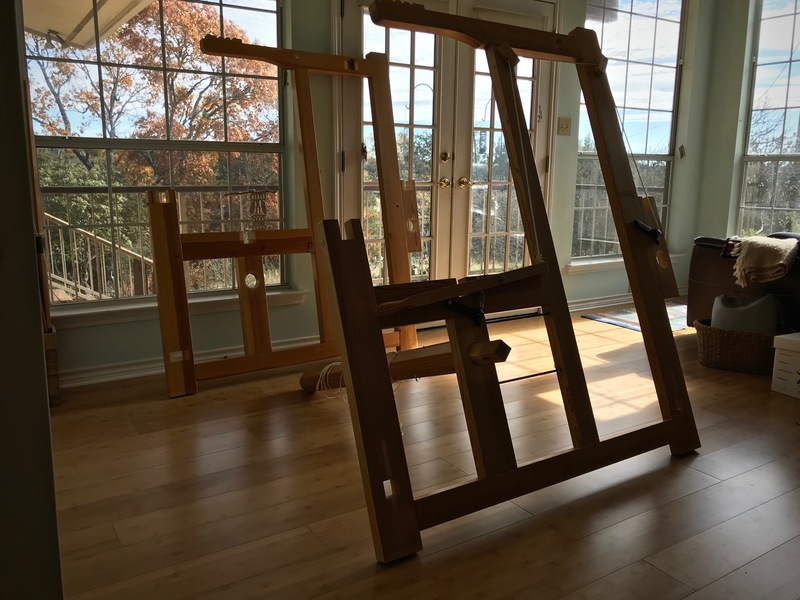 That is something I’ve wanted to do too – drawloom weaving. I heard that Glimakra is designing a drawloom attachment right now that will fit their little Julie countermarche loom. Eager to see and hear about your new adventure! Hi Lynette, I have so much to learn. It will be an adventure indeed. I’m glad to hear that you’re interested. I know you can put a drawloom on the Ideal, but I hadn’t heard that about the Julia. I saw my first drawloom this past weekend at Heritage Fair in Waco. The loom was so big and tall! A hangar is a good place for one. I couldn’t even begin to figure out how to weave with it. I am looking forward to hearing and seeing your adventures on this, Karen. Hi Annie, That’s the very loom that got me interested in drawloom weaving! My three times of weaving at Homestead on that loom got me hooked. So much to learn. I look forward to your posts as you explore the new loom. Hi Nannette, It’s another part of our ongoing adventures! Thanks for your interest. Hi Vivian, It’s sweet to have you along on this journey! 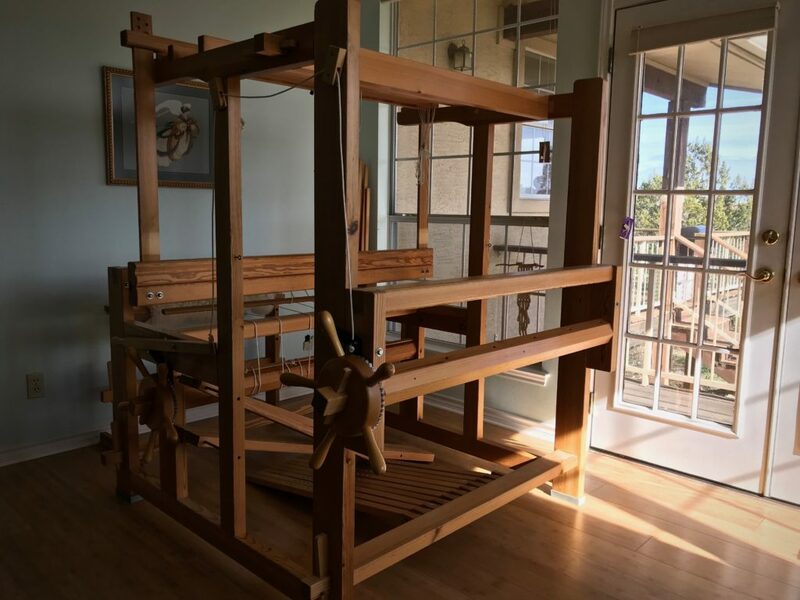 I am also looking for a drawloom or a suitable loom I can convert, if you should come across one in the future would appreciate if you keep me in mind. Hi Janet, Where do you live? I’ll let you know if I hear of anything. 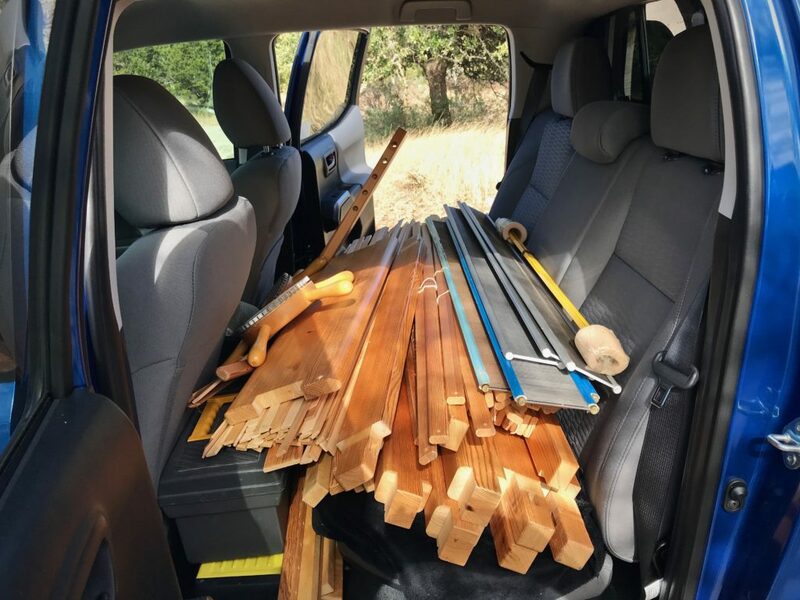 This gives me a great idea for a future post – Where to look for used weaving equipment. Oh Hi, Janet, I didn’t recognize your email address. 🙂 I will keep an eye out for you. Hi Ruth, That’s Fantastic! Oh, you have a wonderful learning journey in front of you. Enjoy the ride! Let me know if I can assist in any way!